What you sow today determines what you reap tomorrow. Today’s challenges that you take on will bring tomorrow’s success. But there is a price that we all need to pay! You will always have to trade something you have in order to get something you want!! That something is your part of sacrifice. Life loses its relevance without challenges. Life is not presented on a silver platter. The path to anything worthwhile is always very tough! There is no shortcut to life’s success. Nothing comes by easily. Without sacrifice there is no success. Power without sacrifice will not be sustained. 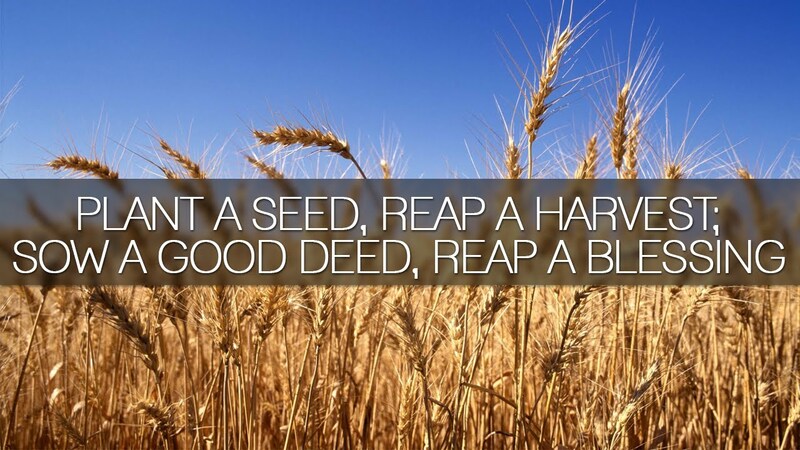 You need to sow in order to reap. Life is full of challenges and hard work. Have you ever noticed that some of us have been deceived into thinking that God would bless us despite not having to work hard and therefore most us wait for God for hand-outs? Immature people always want something the easy way. The whole mark of immaturity is selfishness and self-centeredness. Despite this wrong understanding of God’s ways, the fact of the matter is that the sooner we get rid of this ignorance and the earlier we undertake to face challenges, the nearer you will be in achieving your God-ordained destiny in life. The reason why many of us are struggling and unable to tap into the potential that is locked within us is because of a fixed mindset of wrong thinking, relying too much on the source of human wisdom. Until and unless we allow Kingdom atmosphere and Kingdom mentality to rule our life we will be left struggling behind. The problem is that most of us want to see to believe! But FAITH says we believe first to see latter. Faith says although we are unable see right now yet we believe we will see! Faith is the ability to look beyond the visible into the invisible. Faith is having the courage to let go of the familiar and stepping into the unfamiliar zone. God will not move until you move out of your comfort zone and step into the place of the unknown. Most people do not have the boldness to enter into this supernatural dimension of God’s blessing because of a lack of biblical faith. Although Gods people in the wilderness were brought out of Egypt but unfortunately Egypt could not get out of their mindset. The Egyptian mentality had such a great impact that it was never easy to be uprooted from them. (Egypt in this instance symbolizes the domain of darkness, the place where God’s people were held captive in the world system, were slaves to the ways of the sin nature (the flesh), and subjects to the ruler of the age, Satan (2 Cor 4:4; Col 1:13). A wilderness mentality is a mentality of fear, defeat and failure. You will never achieve or accomplish anything good in your life if you dwell in such a mentality. “I can’t make it mentality” is a mentality of curse and poverty. It is a mentality of excuses which refuses to face challenges in your life. God can never partner with you, God can never cooperate with you, as long as you walk in fear because fear depletes faith. God can only meet you at the level of your faith. When Peter was sinking in the water Jesus stretched out His hands and lifted him up and said “Why did you doubt?” (Matt.14:29). The power of God’s presence to perform a miracle will only manifest when there is a tangible presence of faith. Some people wait and expect things to happen in their lives. They don’t seize the opportunity. They don’t understand that opportunity only multiplies when they are sized. The anointing that enables us to decode the move of God in our lives is apparently missing in many of us and thus we fail to flow in the direction of God’s will and we miss out on God’s plan and purpose. That’s the reason why we don’t get the key to unlock the treasure hidden in us. God will always give His children an opportunity but we need to find it. When God gives you an opportunity you need to do something. A lot of us make the mistake by sitting and waiting for opportunity to come to them. But you know what? The truth is that opportunity is all around us but we fail to see it, we fail to take advantage of it. Some of us are sitting right on top of an opportunity and yet unable to notice it. A sick man missed his healing for 38 years because he gave excuses all the time and waited for others to act on behalf of him. (John 5:7) You see, an excuse is a reason to dwell in the same place. You must think differently in order to succeed differently. You cannot hope to stay in the same zone of mindset and expect God to change your circumstances, neither can you keep doing the same thing and expect to see different results. God can never lift you to the next level of prosperity as long as you become too satisfied with where you are at the moment. You will notice people who are squatting in this zone will give a mountain of excuses to keep themselves from getting involved deeper in the Lord. But God always gives a timeframe for each person. When that season expires He knows how to get you on your knees and draw you closer to Him once again.